My original plan for this essay was to analyze the problem spaces filled in by Hegemony and evaluate briefly how defensibly this problem space was presented in light of what ancient evidence suggests about ancient battle. Playing the game, reading the manual, and, most importantly, engaging in the process of using a game to encourage thinking about a relatively unfamiliar problem space have led me in a different direction. I have been writing on the subject of using simulation games to help students study the past in terms of dynamic systems for some time. And as an educator, I regularly attempt to put myself in my students’ cognitive shoes, to see things and encounter problems as they might. Hegemony allowed me the chance to experience more authentically how a sim can encourage students to think, question, and problem solve in an unfamiliar domain. To be fair, my dissertation and first book were on the Roman citizen cavalry of the Republic, and my third book on the military and political career of Marcellus (cos. 222 etc.). I do not (really!) spend all my time poring through works on ancient battle, and, more importantly, I have never had much opportunity at all to consider Philip II of Macedon’s problem spaces, other than at a superficial level. So while I am familiar with the basic narrative of Philip and the main characteristics of the Macedonian army, my knowledge on these would not fill more than a vaguely worded page or two. So it was with fascination that I took to Hegemony and it is my interaction with the game as an interpretation of history that I most want to share. First, though, it makes sense to describe the game. Hegemony is a real time strategy game that combines elements of grand strategy, strategy, operations, and military tactics. The player assumes the role of Philip of Macedon—or more strictly speaking a divinely omniscient version of Philip—the mid fourth century BCE king of a fragmented collection of Macedonian tribes and cities (Macedon was a region north of classical Greece in the Balkan Peninsula). The goals of the player are to extend Philip’s hegemony, his political and military authority over the territory extending from Illyria in the west, to Thessaly, northern Greece, and the Peloponnesus in the south, to Thrace and Ionia in the east. This is essentially accomplished through a series of military actions with moments of diplomacy scattered in between. 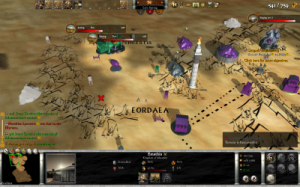 One of the compelling features of Hegemony is that it allows the player to zoom out and command troops at the grand strategic level and zoom in to a particular battle and manage individual unit tactics. The ability to play at different levels of detail and the reasonable sophistication of unit tactics provides a level of flow to warfare that is not matched by other ancient wargames. The player can levy a variety of historically appropriate units—from phalanxes to peltasts, from light cavalry and heavy cavalry to archers—by selecting a controlled urban center and drawing from that center’s population to raise a unit. Each unit has a level of morale, food supply, and initiative, and each unit has different uses in battle. Heavy infantry close into hand-to-hand combat, peltasts throw javelins, yield ground, then regroup for another throw, heavy cavalry mount formidable flank and rear attacks but are overwhelmed when attacking well-formed heavy infantry at the front. Equally important for the historical validity of the game is the role of supply and logistics, something Hegemony models more effectively than any other game of ancient warfare. The player’s supply network is at the core of the game systems. Villages and cities are the foundation of the system. Each urban center has a certain amount of manpower and provides a certain amount of food. Nearby farms can be linked to a city by supply lines, causing food from the farm to be gathered in the city. Supply affects each unit in two critically important ways. First each unit must maintain an adequate supply of food. If the unit is out of supply and out of food, its morale will drop precipitously, and it will disintegrate at first contact in battle. Units supply themselves with food either by being in the radius of a farm or allied city, seizing food from the supply trains of an enemy, or bringing flocks of sheep along with them for resupply. 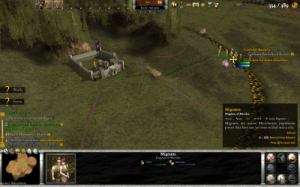 Allied cities, in turn, need to be connected to the larger network of the player’s cities in order to meet the food needs of large multi-unit armies. Second, supply lines determine the availability of recruits. A unit that is below optimal strength will only receive new recruits if it is within the radius of a supply node that is connected with the unit’s home city. What this means in practice is that the player must always be concerned with maintaining supply lines, managing the flow of food to meet the needs of individual nodes, and guarding the nodes and links. A cursory glance reveals all the gamified features that any player/student of historical simulations must note then move beyond: bright colors, flashing indicators, the ability of the player to zoom cameras in and out, rotate them 360° and shift several hundred miles. To this we can add the ability to know immediately when a city is approached by the enemy, the ability to command any unit at once, etc. These along with the inevitable scaling down of units required by a game (so that a unit of 50 game figures represents a phalanx that would have numbered at least 300-ish at the size of the smallest tactical units or 9-10,000 as the whole phalanx of an army). I am absolutely confident the designers, especially after Jim McNally’s essay on caricature, are well aware of these decisions made for gameplay, and I am not interested in criticizing them. These are simulation games after all and the medium shapes the message. There are some questions I am looking forward to discussing with Jim McNally about the interplay between the demands of game design and fidelity to historical evidence. For now, suffice to say that anyone who plays this game and reads the manual will be hard pressed to fault Longbow’s historical sensitivity. Of course, there is no such thing as a completely accurate simulation of the past, just as there is no such thing as a completely accurate representation/interpretation in other media. That said, it is striking how often the developers note not only what their researches suggest about the ancient world, but imply how they have practiced caricature, simplified knowingly and intentionally. To name just a simple example in the game: when the income of the empire exceeds expenses, there is no accumulation of gold—the excess is lost. 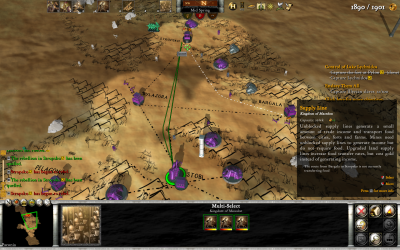 Below the explanation of this mechanic in the game manual comes one of the many historical notes Longbow provides: “During his rise to hegemony, Philip spent any wealth that he gained to further expansion.” The designers know that unspent income accumulates, but opted for a mechanic that would capture the constraints of Philip’s military system. More importantly, they essentially explain why they chose the design they did. One can challenge their solution, but not their awareness of the historical problems. These opportunities manifested themselves as I considered critically the role of time and distance in Hegemony. The road to historical questioning starts with a problem. In this particular case, the problem was that my main army was occupied in the southern reaches of Macedonia and northern Thessaly, extending my hegemony in the region. Meanwhile the Illyrians and Paeonians in the north continued to harass my cities. This situation was frustrating to say the least and, in its ability to frustrate, immersed me within Philip’s problem space. The belligerent tribes (as I saw them) could send sizeable forces of heavy and light infantry along with cavalry. Sometimes they raided surrounding farmlands, damaging my economy. Other times they besieged cities. Generally speaking, because the enemy AI could target one of my cities or supply nodes at a time while I had to protect them all, it had the advantage of massing forces. My resources were finite, so having a full army stationed at each city was out of the question. It was not even particularly practical to have a main strike force in a region; the costs and supply demands of fielding such a force in addition to garrison troops was prohibitive. If, instead, a central army were created in a region by forgoing garrisons in each city, the problem would be one of speed. Armies take time to travel and ungarrisoned cities would be easy pickings. So the problem space revolved around how to allocate resources and soldiers to protect a system whose individual nodes were too numerous to protect fully – farms, mines, cities, and supply lines. One of the various solutions that I tried was to recall the field army with Philip’s elite Companion Cavalry to check raiders. Sometimes walled cities fell to the invaders after a siege, often it seemed before the field army could arrive. The question arose – was this really an accurate representation of the times involved in travelling and in siege warfare and the troops necessary for such actions. In a sense feeling that I should be doing better led me, a little hubristically, to wonder whether the game was accurately modeling these dynamics. That’s what’s so powerful in historical simulation games. Though it may require a teacher to prod students to question, simulations are excellent by design at calling into question how “it really worked.” They immerse the player in choices that are made, fundamentally, based on how the player understands the game world and, at a deeper level, the real world to work. The dissonance that occurs when the game does not meet expectations helps to inspire and focus questioning. So, questions in mind, I began to experiment and research. This is another strength of simulations as problem spaces: they encourage player/students to analyze how parts work together and conduct experiments in ways that are difficult if not impossible to achieve with texts on the subject. First I read in the manual that an hour in the real world represents a year in game time. Doing a little arithmetic that means that each minutes represents about 6 days, or a day passes every 10 seconds. From there I could start to estimate siege times and travel times. It turns out that it takes light cavalry about 1 minute, 15 seconds to travel between about 75 miles (I timed the cavalry journey between two cities in the game that I could check the actual distance between on a historical map). This means the cavalry travelled about 10 miles per day. That’s pretty slow for cavalry; the Macedonian field army could travel perhaps 13 miles per day, the Roman imperial army, 20. Cavalry alone could at times travel 40 miles per day and it is not unreasonable to suppose that a cavalry force in urgent need could travel 20-25. As for sieges, I took one walled city with two phalanges and my companion cavalry in just over three minutes, 18 days in game time. Siege times in the ancient world could vary greatly. Without siege engines, however, and often even with them, besieging armies would have to wait for starvation in the city or, more commonly, someone in the city to betray it. Sieges generally took on the order of months. So my cavalry may well have been designed to move too slowly and sieges designed to be finished too quickly, adding to the sense of imbalance I felt when rushing back to my northern borders. Now, I would want (and I plan for amusement) to do a great deal more experimentation and research on travel times and siege times before I committed to a final evaluation of the game’s validity in these areas. What is important is that this is sort of information (travel times, days marches, siege times) that, generally speaking, bores many of us to tears. It is esoteric if not hopelessly irrelevant out of context, difficult information to use in any meaningful way. Simulation games, however, give a problem space for context, however, and make it easier to discriminate helpful from unhelpful information. They make such information potentially very interesting and valuable because it helps in understanding a system. And therein lies the great value. One can argue that these are just games; one can argue that they should not be used to study the past. But once one recognizes that the past is negotiable and history is about furthering evidence based discussion about cause, effect, and meaning in the past, exercises like the ones I undertook in analyzing this game and expressing it in this are fundamentally valuable exercises in historical criticism. They are the sorts of exercises students, aficionados, and professionals alike should undertake. As a graduate student in English, I’ve always approached games from a narrative standpoint, which is why I’m fascinated by your experimentation with Hegemony. It never occurred to me to interact with a simulation game in this way (considering it as a representation or approximation of historical moments and spaces). Caesar III was one of my all time favorite simulation games, and I’ve been meaning to write on it (and replay it) for a while. Your essay has opened a lot of new ideas. Have you already used this game in a classroom setting? And if not, make sure to update when you do, because I’d like to know how the students react (like it or hate it) to approaching a game with this kind of methodology. Thanks for the comment Jonah. I have used a number of simulation games in the classroom this way, thought not Hegemony. Real time simulation games like East India Company, and the various city builders, and the Paradox games, lend themselves particularly well to this kind of systems analysis. Though it works with turn-based sims too. This is still a new area in pedagogy and there is much to be discovered, but the promise of getting students to treat the study of the past more as an open negotiable exploration of evidence and construction of interpretations, makes it worthwhile. How students respond to it could take another book in its own right. For now, Ill just say that these sorts of lessons are definitely helping me coach them to develop excellent analytical thinking. For that reason, and because students’ reactions to games and sim games will vary widely, I always focus on the analytical benefits, and never propose that playing sim games will be a fun experience. For that matter, I never suggest that writing a persuasive essay will be fun either — that’s not the primary justification. You might be interested in my book on using sim games in the history class, Gaming the Past, or checking out my writings on gamingthepast.net for more of this sort of discussion.